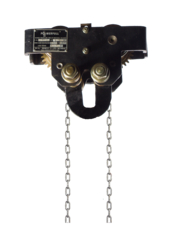 Leading Manufacturer of chain pulley block - 10t x 3mtrs isi marked, manual chain pulley block-0.5t x 3mtrs lift, manual chain hoists - 1t x 3mtrs lift, hand pulley block - bare - 0.5t, geared trolley - 3t x 3mtrs lift and chain block hoist - isi marked - 2ton x 3mtrs lift from Mumbai. Owing to our rich industrial experience in this domain, we are actively engaged in offering supreme quality Chain Pulley Blocks. The offered blocks are designed for long & dependable services. 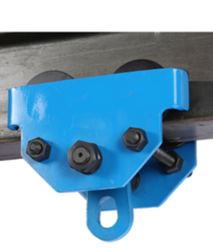 Our offered blocks are assembled with screw & friction disk type brake that ensures full safety at all positions. These are used in various heavy duty industries like moulding, dying, casting etc. Clients can avail these blocks from us in various specifications and delivered within promised time-frame. 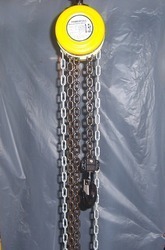 By utilizing our years of experience, we bring forth a qualitative array of Manual Chain Pulley. The block offered by us is manufactured using superior quality raw materials and the latest technology at vendors' end. Moreover, a team of our vendors' quality experts conducts a series of quality tests on the entire range of block to seek out any probable defect. In tune with industry standard, we provide this block in various specifications at market leading rates. 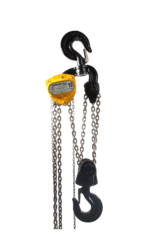 We are proclaimed in the market as a major entity involved in manufacturing and supplying Chain Hoists. 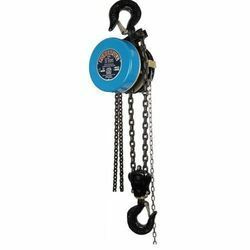 Our offered chains are widely accepted in the market for their superior efficiency and sturdiness, owing to their procurement being done from reliable vendors. 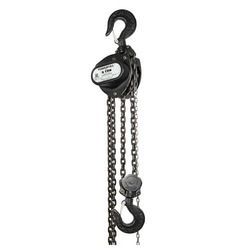 Furthermore, these chains are provided to customers in varied specifications as per their need at equitable rates. To meet the diversified requirements of our prestigious clients, we are a prominent manufacturer of the assorted collection of Hand Pulley Block that is used to lift different types of heavy equipment. The Hand Pulley Block offered by us are made using the finest quality of the raw material and are incorporated into the helical super gear train and are provided with no bush system. In order to ensure easy and efficient operation, the geared trolleys are made using a perfect material. 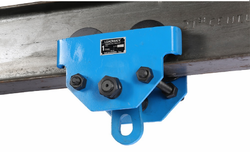 Being lightweight and sturdy, these Hand Pulley Block are widely used for material handling. Moreover, these are stringently tested on several parameters before delivering the same to clients. We are engaged in manufacturing and supplying Geared Trolleys, which are used for the transportation of materials at industrial sights. These trolleys are equipped with sturdy pendant throttle to control the speed of the trolley as per the convenience and requirement. Developed in compliance with industrial standards, these are also available in customized specifications to meet the various needs of the customers. 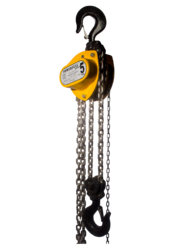 We are a prominent manufacturer and supplier of the best quality Chain Block Hoist, which is widely used by the clients for various industrial purposes to lift goods. 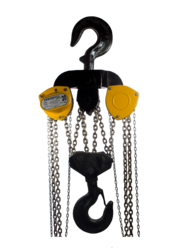 Backed by a team of highly skilled professionals, we are actively indulged in providing Chain Blocks Hoist. Our offered products are designed in compliance to meet the Indian as well as international standards. We are one of the renowned organization, involved in manufacturing and supplying a wide assortment of Heavy Duty Pulley Block. These pulley blocks are manufactured using high-quality steel and other quality tested raw material, procured from reliable vendors of the market. All the pulley blocks offered by us have friction free rotation and high loading capacity. Further, to meet the variegated demands of our valuable clients, we offer these products in various sizes and other specifications. 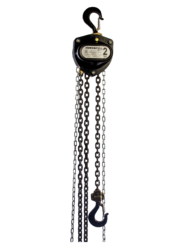 Backed by a team of dexterous professionals, we are engaged in manufacturing and supplying high-quality Chain Manual Hoist. These hoists are widely used for lifting heavy loads in various industries, factories, warehouses and godowns. Offered blocks can bear heavy loads and are designed and developed for excellent performance. We are instrumental in manufacturing and supplying Push Pull Trolley, which is available in both, hand chain wheel driven trolley, and motorized trolley, as per the needs of the customers. These trolleys are widely used for drilling rigs, material handling, and in mobile cranes. Our quality controllers conduct stringent tests before dispatching thees trolleys to ensure hassle-free operation with a longer service life. We have gained huge prominence in manufacturing and supplying superior quality I-Beam Trolley. These trolleys are made from a very high-quality raw material which ensures hassle free work performance at its user end. These beam trolleys are widely found its applications in various material handling industries. Apart from this, wide specifications of these trolleys are available with us for serving variegated needs of customers.